Fears rise on Friday, next they ease on Monday…, a pattern we have been seeing for weeks. Like a pendulum swinging. Will it continue that way? It is quite possible. Just like last week, I remain mildly positive about the market as long as each relief rally goes a little higher than the previous one. That’s how walls of worry get climbed. The rebound has taken the S&P to double overhead resistance. Earl and MoM indicators turned up from major bottoms a week ago, and now the slower Earl2 is at the point of turning up as well. 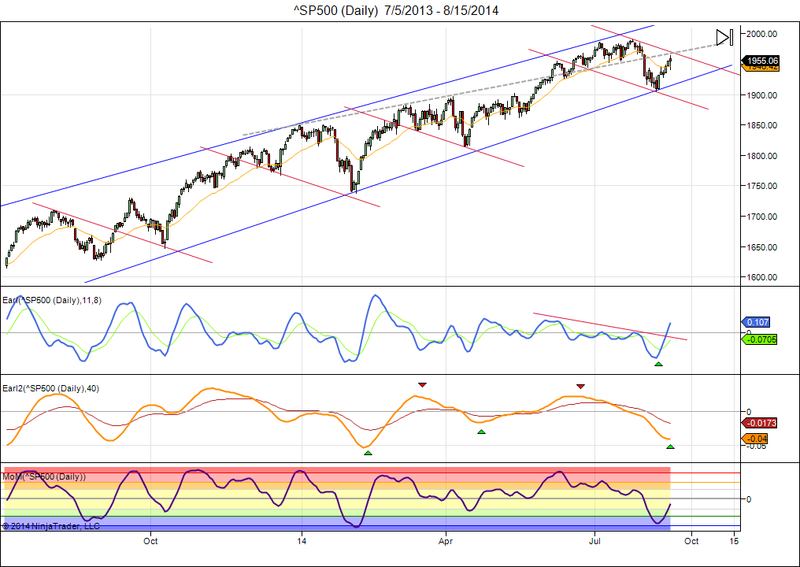 Technically, a further rally to 2000+ is easily possible, but of course not guaranteed. A failure to climb above 1970 would not bode well for the market and a decline below 1910 would confirm a second move to the downside. This entry was posted on August 18, 2014 at 9:47 am	and is filed under Financial Astrology, Market Commentary. Tagged: lunar cycles. You can follow any responses to this entry through the RSS 2.0 feed. You can leave a response, or trackback from your own site.